Ford Motor (NYSE:F) has announced plans to partner with pizza maker Domino’s (NYSE:DPZ) to test pizza delivery using self-driving cars. Russell Weiner, president of Domino’s USA, said, “We are delivery experts. This is where the industry is going. 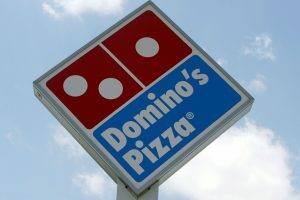 We think we are the right company, and we certainly are working with the right partner to make this happen.” Domino’s and Ford began testing the concept Tuesday in Ann Arbor, where Domino’s is based. Domino’s wants to make sure it continues to explore innovative ways to get pizzas to the right place as fast as possible. The company began delivering pizzas to homes in 1960 and is now the nation’s second-largest pizza chain, delivering more than 1 billion pizzas worldwide every year. The tests are being used to determine whether customers like the idea of driverless-car pizza delivery. The Ford Fusion hybrid autonomous research vehicle will be used as the self-driving pizza delivery vehicle. Engineers at Ford and Roush Performance outfitted the Fusion with additional hardware and electronics to turn it into a delivery vehicle. For now, the testing only involves one vehicle at one Domino’s pizza location in Ann Arbor. The sedan has markings and gear on the roof to indicate it is self-driving. Randomly selected Domino’s customers in Ann Arbor will be asked whether they are willing to participate in the research project over the next several weeks. If they agree, customer will receive a text message when the self-driving Ford Fusion hybrid arrives at their home with their pizza. The vehicle has been equipped with a touchscreen interface tablet mounted on the outside to guide the customer through the entire process. The customer will enter the last four digits of his or her their phone number on the tablet to open the window. The customer can then pull the pizza out of a compartment designed to keep the pizzas warm and stabilized in the vehicle. If the customer enters the wrong number three times, the customer will be directed to call the store for assistance. If customers linger too long near the vehicle, they will be asked to step away so the car can safely drive away. While the Fusion hybrid is capable of driving itself, an engineer will be onboard for the testing in order to comply with current regulations regarding commercial use of self-driving vehicles. The windows will be tinted to prevent the customer from seeing the driver. Afterwards, customers will be asked to participate in a survey on how they liked the service and whether they encountered any issues.